"As Maine goes, so goes the nation." This old political adage refers to Maine voters' nearly perfect record in predicting the outcome of national elections, which was due at least partly to a peculiar feature unique to that state. Until 1957, the voters of Maine went to the polls in September, rather than November, as is customary elsewhere. The need for this long lead time was prompted by the geographical remoteness and difficulty of travel in olden times; also, the harsh winter conditions made venturing outside one's house in November an unsettling prospect. By the mid-20th century, however, these problems were overcome, and Maine got into step with the rest of the United States - well, almost. Even in the 21st Century, Maine is one of those states that Americans outside of New England tend to forget about. It doesn't make the news very often, and that's just fine with the folks who live there. They get their fill of outsiders during the fishing and hunting seasons, and they don't need the rest of us any other time. 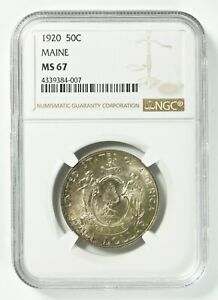 After all, it was just such feelings that led to Maine becoming a state in 1820, an event celebrated one hundred years later with the issuance of a commemorative half dollar. Visited by the French as early as 1604, English colonists soon followed. The two cultures co-existed in sparsely settled and isolated communities through the remainder of the 17th century, with the English ultimately predominating. Originally chartered as a separate province, in 1659 the British Crown directed that Maine be placed under jurisdiction of the Massachusetts Colony. With Vermont and New Hampshire ultimately becoming individual states, Maine was left geographically and socially excluded from the government in Boston. Agitation for statehood grew during the War of 1812, when the people of Maine were largely left to defend themselves with little assistance from Massachusetts. Statehood, however, threatened the delicate balance between free and slave states in the Union, since Maine was clearly set to enter as a free state. Only with the Missouri Compromise of 1820 were their ambitions realized. Maine was permitted to join the Union as the 23rd state on March 15, 1820, with slave state Missouri to follow as the 24th, a year later. 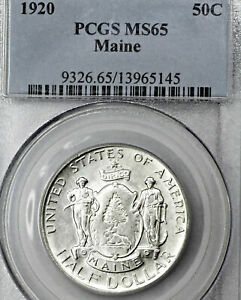 When the one-hundredth anniversary of Maine's statehood arrived in 1920, a commemorative coin was sought to mark the occasion. Surprisingly, the centennial half dollar was envisioned as a circulating issue. 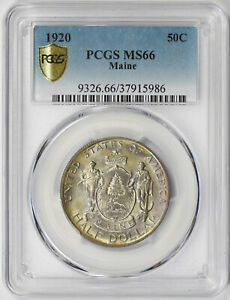 Just such a coin was presented to Congress by Maine Representative John Peters in April of 1920. 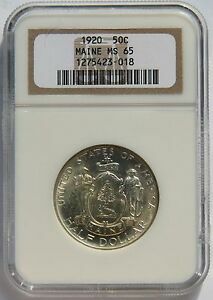 Incredulous, his colleague from Ohio, Congressman Gard, suggested that "some of the thrifty people in the state of Maine will take some of these fifty-cent pieces and put them away where they will never see the light of day again, at least among people who circulate money by spending it." 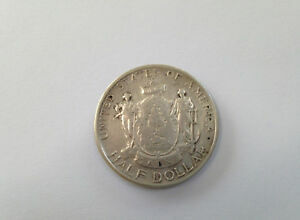 For the most part he was right, of course, as no one was likely to pay $1 for a coin and then spend it as fifty cents. 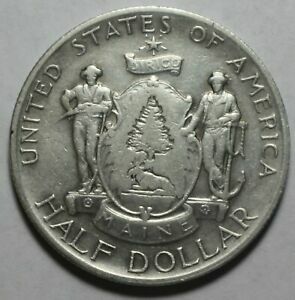 With little further debate, the bill authorizing a coinage of not more than 100,000 Maine Centennial half dollars was passed on May 10. Proceeds from their sale were to help defray the cost of a centennial celebration being held at the state capital of Portland. Sketches furnished by the centennial committee were forwarded to the Commission of Fine Arts on the 14th, with a plea for quick action. Commission Chairman Charles Moore passed these on to sculptor member James Earle Fraser, of Buffalo nickel fame. 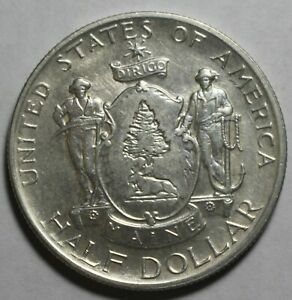 Frustrated in having to repeatedly accept the work of amateurs, Fraser fired off a telegram to Moore: "Mistake to accept design for coin in form of drawing. Model should be made by medallic sculptor of note. Our coins have reached high grade of perfection because this method is used. Design for proposed coin very ordinary. Should not be used." With the deadline for receipt of the finished coins set for June 28, a compromise was reached which, of course, pleased no one. The committee's unimaginative sketches would be used, but a skilled medallist would perform the work of modeling them. Anthony De Francisci, a student of Fraser who would soon earn greater acclaim as the creator of the Peace silver dollar, completed the plaster models in June. These were not approved by the Commission of Fine Arts until July 9. 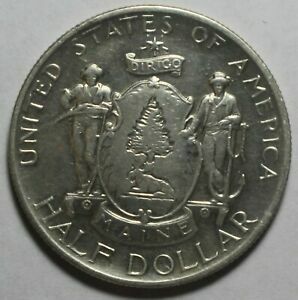 The obverse of the Maine Centennial half dollar features the state seal. An escutcheon bearing a moose and a pine tree is at center, with a farmer and a sailor to the left and right of it, respectively. The Latin motto DIRIGO (I direct) is on a scroll above, with a star above it. Below the escutcheon is a banner inscribed MAINE. 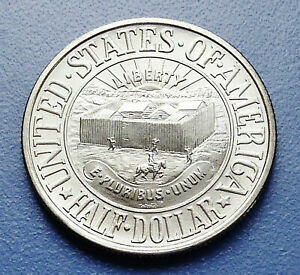 The legend UNITED STATES OF AMERICA and the value HALF DOLLAR are arranged in arcs around the periphery. The reverse is dominated by a wreath of pine branches. 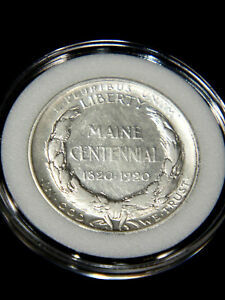 The words MAINE CENTENNIAL 1820-1920 are arranged within it. Above are the statutory legends E PLURIBUS UNUM and LIBERTY; below is the motto IN GOD WE TRUST. The whole effect is mediocre, with each side looking as though it should be the reverse. This imagery was suitable for a souvenir token, but it fell far short of the level of excellence achieved by contemporary coins, whether they were commemoratives or regular-issues. 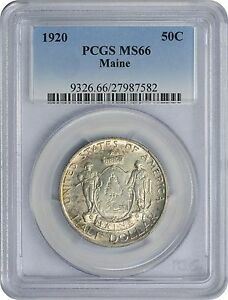 The Philadelphia Mint struck 50,028 Maine halves in the late summer of 1920 (the odd 28 were reserved for assay), but they arrived too late for purchase at the Centennial Celebration in Portland. 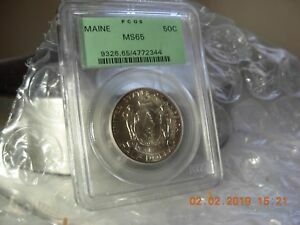 Still, about half of the initial mintage was sold by the state treasurer before the end of the year. 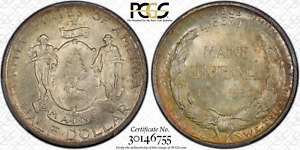 After that, sales slowed to the point where no further thought was given to coining the full authorization of 100,000 (the gimmick of adding a 1921 date or some other distinguishing feature to the additional pieces was evidently not explored). The coins remaining on hand were available until at least 1929, and all were eventually sold. This left a net mintage of 50,000 (the 28 assay coins were destroyed). 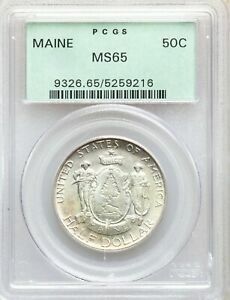 Although the Maine Centennial half dollar fell victim to poor design and even worse timing, the program was free of the scandal and controversy which plagued many other commemorative issues. 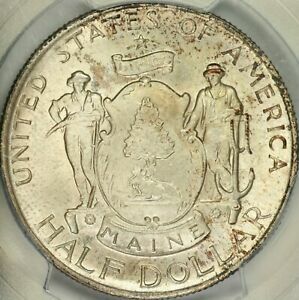 Congressman Peters may have been at least partly correct about the people of Maine spending their centennial half dollars; quite a few are found in circulated grades, some as low as Fine! Most of these were probably spent during the Depression years of the 1930s, long after the celebrations ended. Some may have been carried as pocket pieces from the outset. Most circulated examples grade between EF-40 and AU-50, oftentimes with evidence of harsh cleaning. The coins were not made with great care, as their highpoints are often weakly struck. These include the faces of both farmer and sailor, as well as the pine tree, which is indistinct even on the artist's models. In addition, the dies were crudely polished, leaving a number of raised, irregular lines on the coins' surfaces. This condition was aggravated further when the dies clashed and were polished even more, although these later coins struck up better because of their unintentionally lowered relief. Wear first appears on the hands adjacent to the escutcheon and on the wreath's bow knot. Uncleaned, mint state examples typically have a satiny luster, although prooflike and semi-prooflike pieces form a minority of survivors. 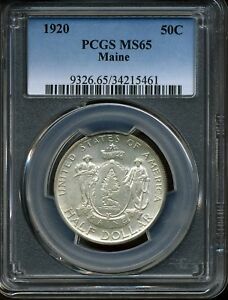 Grades MS-60 through MS-63 are usually available, while higher grades, especially MS-65 and above, are quite scarce.The relative simplicity of their design made the Maine half dollars subject to numerous contact marks even before leaving the mint. Subsequent careless handling by the mostly non-numismatic purchasers has greatly reduced the number of desirable specimens. 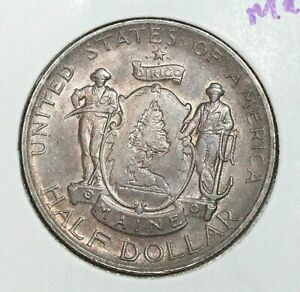 One or more matte proofs are known, as are forgeries made by sandblasting well-struck, regular coins to simulate proofs.